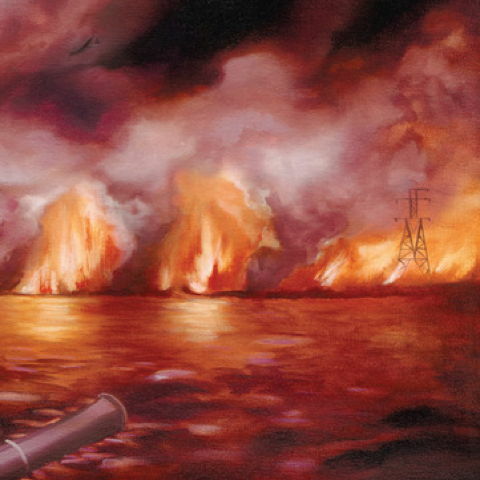 The Besnard Lakes are Coming to Glasgow… | Scots Whay Hae! It’s sadly a rarity these days that a new album demands to be played over and over. Partly that’s due to my ever decreasing attention span, partly because I’ve been revisiting my old vinyl in a slightly nostalgic mood, but mainly because nothing has grabbed me recently as it should have. The new Midlake, Tindersticks and Josh Rouse, while all perfectly good, and which will hopefully grow on me in time, couldn’t stop me from returning to the scratchy Tom Waits records. The Besnard Lakes new one, The Besnard Lakes are The Roaring Night, has changed this and kicked my nostalgia and everything else into touch. If you are not familiar with them then they are a little bit alt-country, a little bit indie rock n’roll, and a little bit shoe-gazey (a good thing, in case you were wondering). Their debut, Volume 1, originally had a small pressing of 1000, and it was not until The Besnard Lakes are the Dark Horse came out in 2007 that they reached a wider audience. At a time when bands such as Arcade Fire, The Dears, The Stills, Broken Social Scene, Emily Haines, The Stars, Tegan and Sara etc were spreading around the world, the album was another example of Canadians making great music. In fact there is a touch of the super group about The Besnard Lakes with members of The Stars, The Dears and Godspeed You! Black Emperor appearing on Dark Horse.